This model studies the vibration modes of a free and hollow cylinder using an axisymmetric approximation. No loads or constrains are applied as the free modes are sought. The cylinder is 10 m long, has a center diameter of 2 m, and is 0.4 m thick. Moreover, the material of the cylinder is considered to be steel with E = 2·1011 Pa, density 8000 km/m3, and a Poisson's ratio of 0.3. Target free vibration frequencies are given in . This model is available as an automated tutorial by selecting Model Examples and Tutorials... > Structural Mechanics > Vibration Modes of a Hollow Cylinder from the File menu. Or alternatively, follow the step-by-step instructions below. Select the Axi 2D radio button. Select the Axisymmetric Stress-Strain physics mode from the Select Physics drop-down menu. Enter 1.8 into the xmin edit field. Enter 2.2 into the xmax edit field. Enter 10 into the ymax edit field. Enter 0.2 into the Grid Size edit field. Enter 0.3 into the Poisson's ratio edit field. Enter 2e11 into the Modulus of elasticity edit field. Enter 8000 into the Density edit field. Select Eigenvalue from the Solution and solver type drop-down menu. Open the postprocessing settings dialog box, look at the Solution eigenvalue/frequency drop-menu box, and verify that they correspond to the target values 0, 243.8, 378.5, 394, 397.5, 405 Hz. Select the second mode and plot its Total displacement as well as Deformation plot with a scale factor of 1. 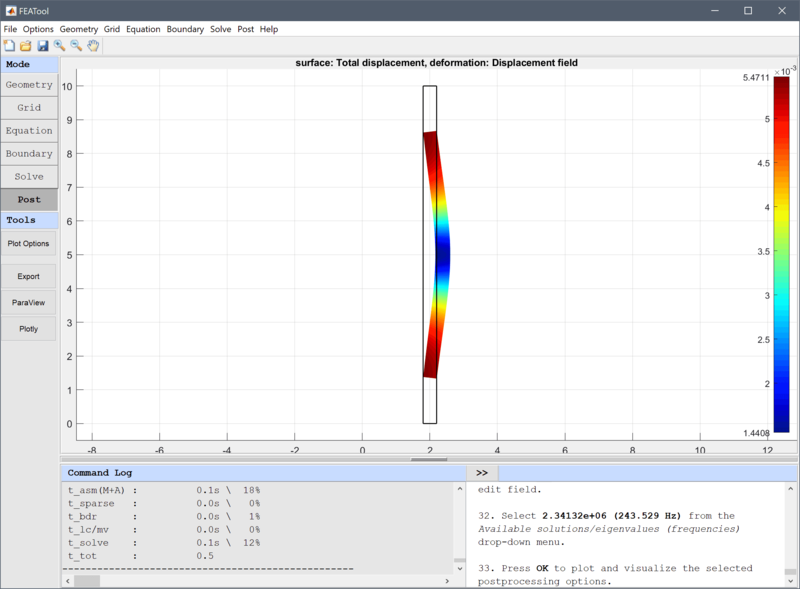 Select Total displacement from the Predefined surface plot expressions drop-down menu. Select the Deformation Plot check box. Enter 1 into the Deformation scale factor edit field. Select 2.34132e+06 (243.529 Hz) from the Available solutions/eigenvalues (frequencies) drop-down menu. The vibration modes of a hollow cylinder structural mechanics model has now been completed and can be saved as a binary (.fea) model file, or exported as a programmable MATLAB m-script text file, or GUI script (.fes) file. Abbassian F, Dawswell DJ, Knowles NC. Free Vibration Benchmarks. NAFEMS, Test 41, 1987.